A leisurely start to the day saw us sleeping in until 8.30am so a bit of a rush to get to breakfast. We were then sorted and I drove us to Ewan's. Discussions on the day followed and saw Stephanie, Mj and I depart for the sightseeing tour. We started by driving up the coast to Sutro baths, past Cliff House and Louie's diner, where we stopped for a photo look and a coffee at the national parks shop. Back in the car and driving around the suburbs, Sea Cliff, Pacific heights, marina district and others. We ended up going by the kids school and stopped at St Mary's Cathedral but could not see in. Next stop was lunch at the grove, which is an Erin hangout. Nice quick food, I had a chilli cheese dog which was not too spicy and lavender lemonade. More travelling and Stephanie were dropped off at Union square to catch the tram to ghiarerdelli square. A mistake and we were on the wrong tram when we got to fishermans wharf but we walked along and met MJ at Buena Vista for an Irish coffee. A nice drink out of the wind and fun watching the gentleman make about 12 in one go. Next a drive around the marina and park at the Golden Gate Bridge for our walk over. It was really pleasant walking and not too windy. Took some stunning sunset pictures so that will be good to see them when we get home. The bridge I have discovered is longer than I thought so it took us a good time to walk across and MJ was worried we were lost. A drive home for dinner and steaks cooked on the bbq for tea. Watching TV passed the evening until 11.30 when Stephanie, MJ and I headed into town to see the fireworks. 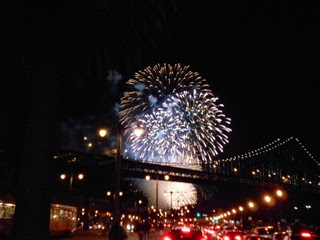 The roads were really empty and as we drove along the embarcadero they started. We just crushed along watching out the car windows, taking photos. A good display and home again, back to the hotel by 1 pm. A call to Marilyn and Virginia finished our New Year's Eve.